Here is a postcard from 1910. On the front it says "What do you know about that! When you have fallen asleep while the tide went out." It strikes me as more odd than humorous. But, the colors are vibrant and this card caught my eye at the local antique store near my home. 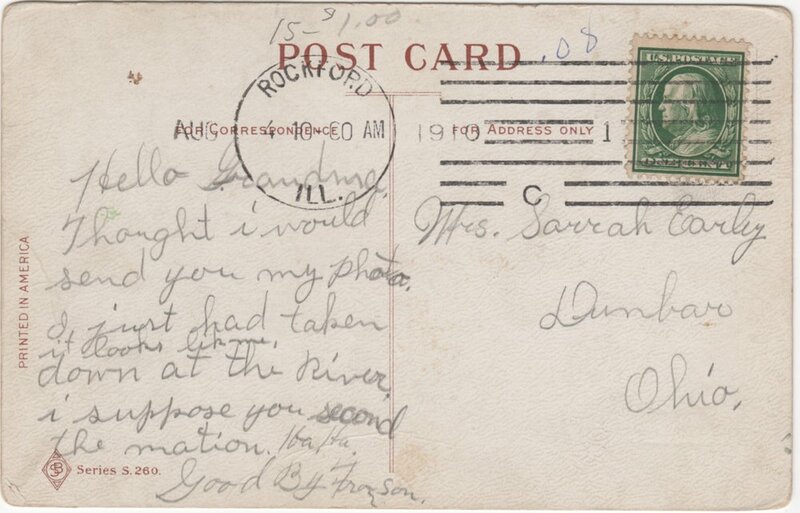 The card was sent from Rockford, Illinois and was addressed to a Sarah Early in Dunbar, Ohio. Thought I would send you my photo. I just had it taken. It looks like me down at the River. I suppose you second the motion. Ha, Ha. Reading the "Ha, Ha" made me think of "lol" that we see so often in modern day text messaging. What do you suppose a person from 1910 would think about the concept of an "emoji"? Do you want to test some of your genealogical detective skills? Is it Sam or Son? If son, why did he call her grandma? Why is the write making fun of himself? What does the from of the card really mean? What ever happened to the writer and the receiver? Post in the comments below or send me an email and I will include them in a future blog updating this one. Here are a few places you could start! Newspaper clippings from newspapers.com, newspaperarcive.com, or genealogybank.com. Never forget Google. It casts a wide net but you might luck out!